The Dovecote is proving to be a big hit for couples who are seeking either a short break holiday for a few days or a longer holiday for a week or two in this secluded holiday cottage themed to provide a unique 'Romantic' atmosphere featuring it's own Private Hot Tub with spectacular coastal views. 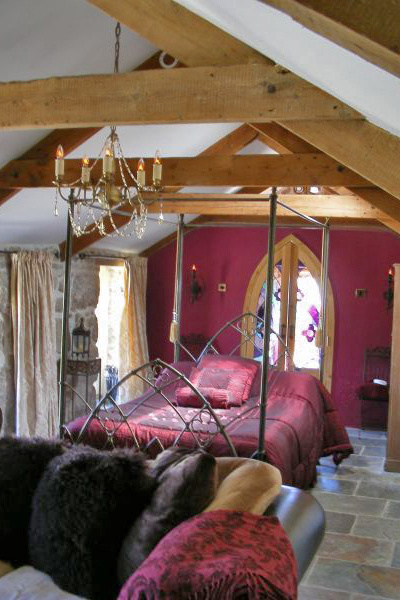 The Dovecote makes the ideal Honeymoon Cottage in this most beautiful and tranquil setting. 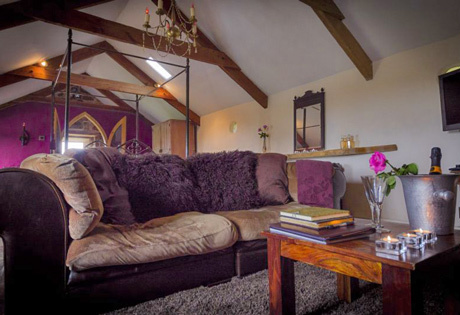 Staying in Dovecote Romantic Holiday Accommodation, you will enjoy luxury 'Serviced Accommodation' with an extensive List of Complimentary Items. Perfect for couples this unique interior space is designed with a contemporary gothic theme with romantic luxury. There is a belfast pot sink Set in deep beech wood, a toaster and a selection of coffee and teas. The large iron four poster bed hand made in Bali dominates the room, quality bedding and sumptuous throws, add oversized sofa with big mongolian cushions and deep pile indian wool rug where you can relax in front of the the large wood burner. Through the gothic shaped hand crafted stained glass doors is the en-suite shower room with views of the sea, with a large walk in shower and a quirky copper sink. Soft fluffy towels on heated towel rail. 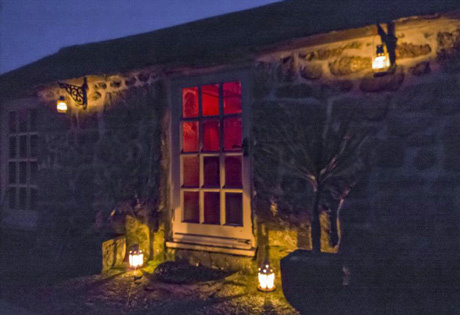 The Dovecote Romantic Holiday Accommodation comes into its own in the evening, lanterns with candles and a glass chandelier, soft muted lights create a secluded romantic feel. This space goes beyond what you would expect of a high quality hotel room, yet has the bonus of sea views from all windows and your own secluded courtyard to eat alfresco if weather permits. 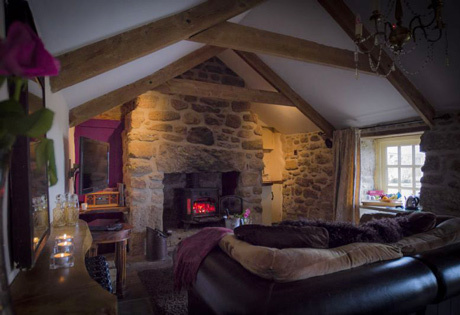 A wonderful place for Honeymoons, to escape the mundane or rekindle romance and enjoy a beautiful place in cornwall. Towels and linen are provided. For your first morning lay in, Continental Breakfast is included plus an optional maid service. 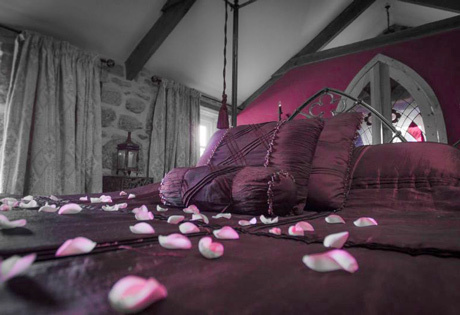 You may like to read some of the glowing Testimonials from the many couples who have enjoyed a romantic break or Honeymoon in The Dovecote Please note: The Dovecote is no smoking and is unsuitable for pets or children. 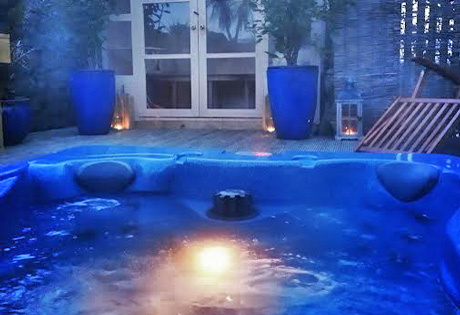 ALL our Luxury Cottages have a Private Hot Tub. NOTE: ALL Dates Listed are Vacant any Dates NOT Shown are already Booked or NOT Available.